The City of Surrey is EXPROPRIATING land belonging to the Riverside Golf Course to CREATE A FRESH-WATER SWAMP [ i.e. SWAMPLAND ]. Several months ago, Riverside Golf Course was informed that the city planned to FORCIBLY EXPROPRIATE 16 acres from its nine-hole facility to extend a road network, while the rest of the land would be used as a CONSERVATION AREA. The City of Surrey’s ULTIMATUM has given Riverside Golf Course until the end of January 2016 to shutter the facility that has been A FAMILY BUSINESS FOR OVER 50 YEARS. The situation has outraged many residents, with close to 1,000 signing a PETITION AGAINST THE EXPROPRIATION. The City of Surrey is offering 200,000 dollars per acre for Riverside Golf Course, amounting to a total of 3.2 million dollars. Golf-Hating Surrey Government Officials declined to comment, saying this has become a legal matter, but Parks Manager Owen Croy said in April 2015 that the city needs the property to EXTEND ITS GREENWAYS [ i.e. SWAMPS ]. According to Golf-Hating Surrey Government Officials, GREENWAYS [ i.e. SWAMPS ] are described as a network of walking and cycling paths [ through SWAMPLAND ] intended to get the growing population engaged in passive recreation and viewing of wildlife [ living in SWAMPS ]. Moreover, according to Golf-Hating Officials, Riverside Golf Course is next to the Nikomekl River, which has a low-level diking system, while the extended road would allow for movement of traffic, emergency vehicles, and pedestrians. Croy also acknowledged to the inquiry that the city’s goal is TO PRESERVE NATURAL CONSERVATION AREAS [ i.e. SWAMPS ]. Riverside Golf Course has questioned why City of Surrey would want to OBLITERATE its business ― which OFFERS ACTIVE RECREATION as well as wildlife viewing of deer and coyotes ― in exchange FOR A SWAMP, especially since there already exists a much larger Serpentine Fen nearby, another SWAMP that is popular with bird watchers. 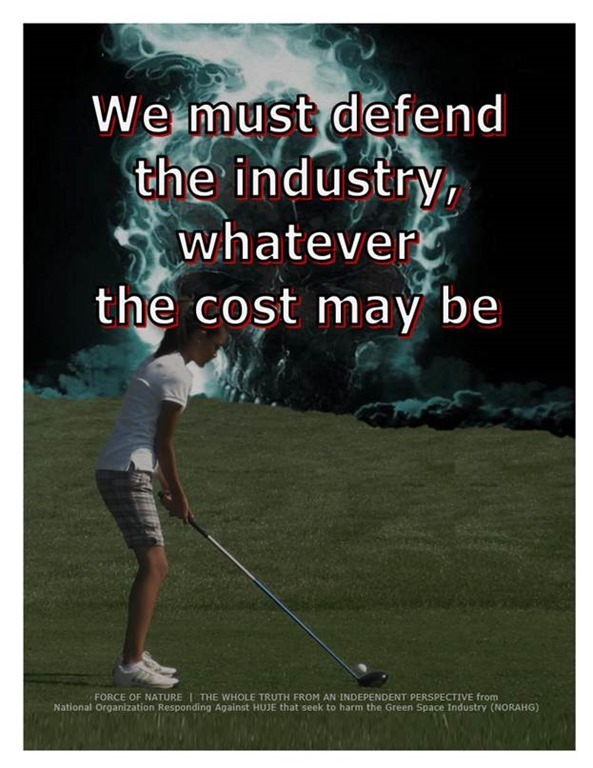 Surreys ATTACK against the Golf Industry comes as NO surprise ! In 2011, Surrey Government Officials IMPOSED PROHIBITION against control products used in the Urban Landscape, leading to the DESTRUCTION of businesses operating in the Professional Lawn Care Industry. 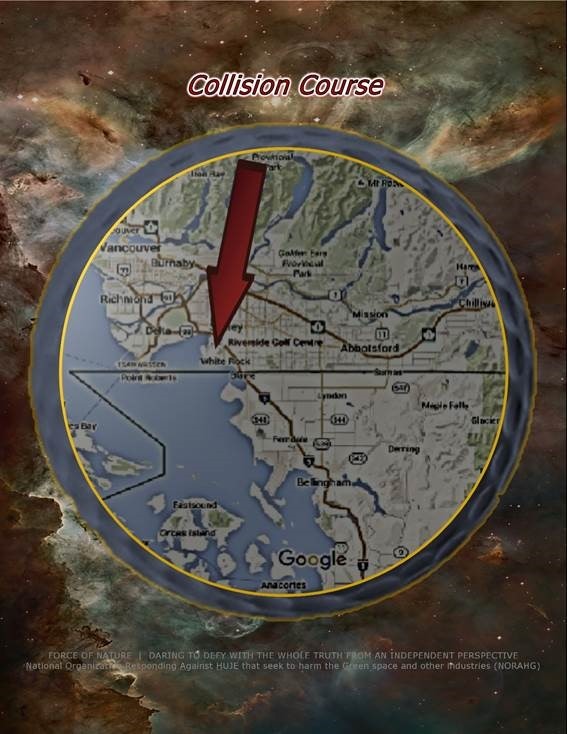 If the Golf Industry’s Trade Associations had joined the Professional Lawn Care Industry to STOP THE SURREY PROHIBITION in 2011, Riverside Golf Course would NOT be fighting for its life today. The leaders Golf Industry’s Trade Associations prefer to operate with their HEADS UP THEIR BUTTS rather than accomplish anything that is meaningful for its memberships and for society. THEY are the ones that ALLOWED Surrey Government Officials to become Anti-Golf Business-Hating Enviro-Lunatics ! The Golf Industry is on a COLLISION COURSE with ANTI-GOLF REGULATIONS that will COERCE, INTIMIDATE, and TERRORIZE the owners, superintendents, and employees at GOLF FACILITIES. The Golf Industry is on a COLLISION COURSE with GOLF-HATING Government Officials ( which includes Politicians ) who perform their jobs as Enviro-Terrorists who CONSPIRE TO OBLITERATE ALL GOLF FACILITIES. In several jurisdictions, Government Officials are already undertaking IMPLEMENT STRICTER REGULATIONS AGAINST THE USE OF PEST CONTROL PRODUCTS ON GOLF FACILITIES. These Government Officials CONSPIRE TO DESTROY the Golf Industry just as they DESTROYED businesses operating in the Professional Lawn Care Industry. Unfortunately, prominent trade organizations, with several in the Golf Industry, have already SUPPORTED RECKLESS PROHIBITION against so-called cosmetic pesticides, a BETRAYAL that ASSURED THE DEATH of the Professional Lawn Care Industry. In the near future, provincial jurisdictions, like Quebec and Ontario, WILL IMPOSE NEEDLESS, SENSELESS, and MALICIOUS PROHIBITION against pest control products used by the GOLF INDUSTRY. The governments in these provinces WILL IMPOSE TOTAL GOLF PROHIBITION against conventional pest control products. The governments in these provinces INTEND TO OBLITERATE THE GOLF INDUSTRY. And they will succeed in doing so with the help of GOLF-HATING Anti-Pesticide & Environmental-Terrorist Organizations like David Suzuki Foundation, Equiterre, and others. It is IMPOSSIBLE to maintain GOLF FACILITIES in a condition that is BEAUTIFUL AND PLAYABLE without the use of conventional pest control products. Because of ARBITRARY AND UNNECESSARY PROHIBITION, the owners, employees, and families dependent on GOLF FACILITIES will face TERROR, DESPAIR, and DESTITUTION. 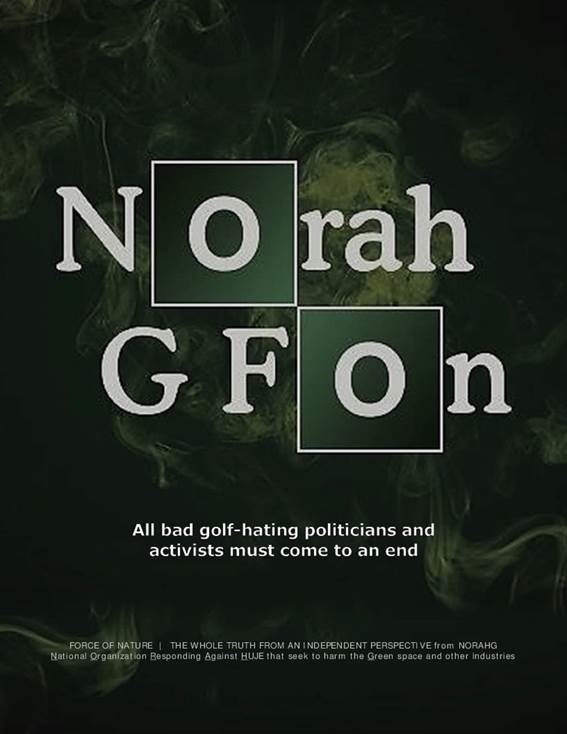 GOLF-HATING Government Officials ( including Politicians ), with Anti-Pesticide & Environmental-Terrorist Organizations, CONSPIRE to OBLITERATE their businesses, their assets, their customers, their homes, their lifestyles, their job security, their families, their children, their loved-ones, and their futures. 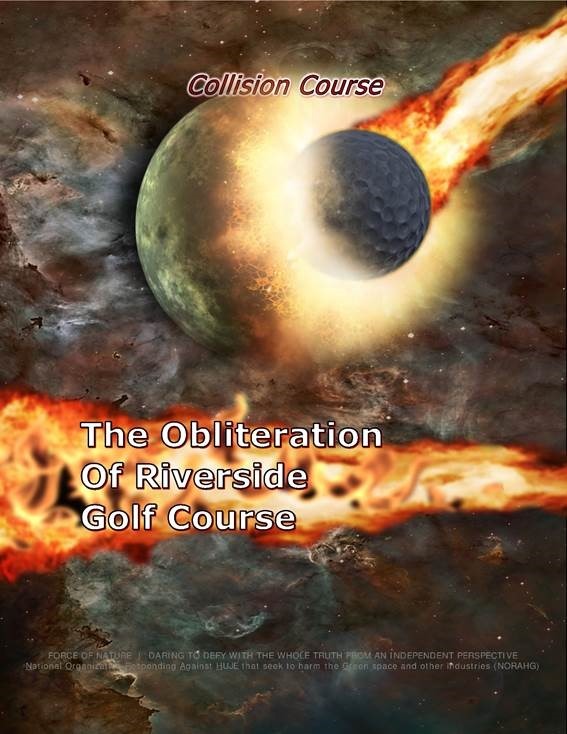 Golf Industry’s Trade Associations Could Not Care Less About The Obliteration Of Riverside Golf Course ! The mission of the Golf Industry’s Trade Associations is to promote and support the golf course management profession. There can be NO golf course management profession if facilities like Riverside Golf Course are being SYSTEMATICALLY OBLITERATED by Golf-Hating Government Officials and Environmental-Terrorist Organizations. • CONSPIRED to IMPOSE PROHIBITION against pest control products used in the Urban Landscape. • BETRAYED and TORPEDOED the Professional Lawn Care Industry. • SQUANDERED LOBBYING RESOURCES in order to SAVE TOXIC PRODUCTS like QUINTOZENE by CONCOCTING A NON-EXISTENT CRISIS. • ALLOWED THEMSELVES TO BE APPEASED by Golf-Hating Anti-Pesticide Organizations, like Canadian Cancer Society. • PAID VAST SUMS OF MONEY to known Anti-Pesticide Terrorists, like Paul Tukey, to SUBVERT and CORRUPT the Industry Trade Conventions. • RAISED MILLIONS OF DOLLARS for Golf-Hating Anti-Pesticide Organizations, like Canadian Cancer Society. Could Not Care Less About The Obliteration Of Riverside Golf Course !